I mentioned in an earlier post how I love tomatoes primarily for the taste and the vitamins they contain. 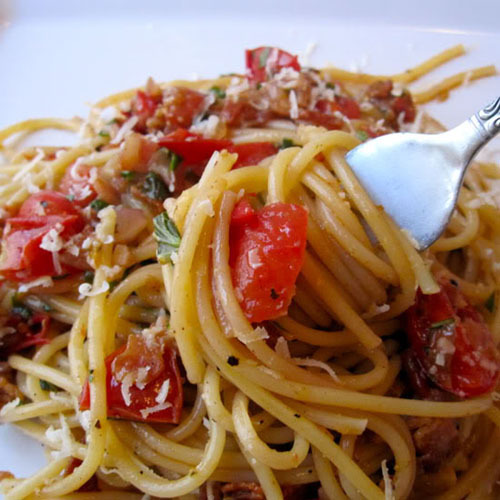 Here's another recipe using tomatoes. It is a slightly modified version originally made by SunRipe Produce. They call it SunRipe Bella Roma and can be looked up online. In a large skillet, heat olive oil and saute garlic. Add tomatoes, salt and pepper. Simmer sauce for 10 to 15 minutes; do not overcook the tomatoes. Meanwhile, cook pasta according to package directions. Spoon sauce over pasta and sprinkle with parsley, basil, and bacon before serving.